Sheryl is a member of the local, state, and national associations of REALTORS® who, prior to becoming a REALTOR®, worked for a national technology company presenting public sector software to potential clients across the country. That experience has been invaluable in helping clients navigate efficiently through the sometimes complex environment of real estate. To further assist her clients, she has also earned the Graduate, REALTOR® Institute (GRI) designation, the Senior Real Estate Specialist (SRES®) designation, and is an Accredited Staging Professional (ASP-RE®). With patience and empathy, Sheryl is able to quickly discern what clients are looking for and focus on their needs. 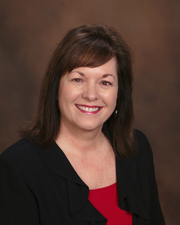 She works with clients on the buying and selling of their homes, income properties, and real estate investments. As an owner of farmland and someone who understands the value of a family legacy, she also brings a unique perspective to those interested in farm and ranch properties. Sheryl is the Treasurer of her homeowners’ association and Program Director for the local association of staging professionals. She and her husband, Glen, also own Realegacy Partners, LLC, a local financial consulting firm. They enjoy spending time with family, volunteering at the Lubbock Dream Center and their local church, and making annual mission trips to Central America. Sheryl is also a proud member of the Veterans Advocacy & Benefits Association.